Managing Editor Josh Vanderwall says: I've never played a Dragon Age game before, and I didn't really intend to play this one. My wife started playing in the evenings while I entertained myself with the games I did intend to play, but every day I found myself playing fewer and fewer hours of my own game, and putting more and more of those hours into hers. This went on until one day I realized that I was no longer playing my own games at all, and, frankly, she was no longer in control of her Dragon Age adventures. 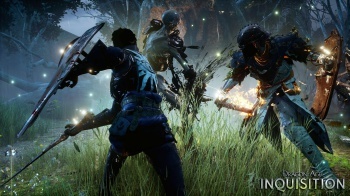 Even when it's in the periphery, Inquisition's story and characters are wildly compelling, and if you find yourself in the same room as someone playing it, you'll inevitably take frequent breaks from whatever it is you're doing to listen to the dialogue, and most likely start grilling your companion about what's going on in the world at large. Beyond the impressive number of voiced conversations, the breadth of the game and story are mind boggling. At home, we collectively sunk two or three dozen hours into DA:I when we hit what seemed like the inevitable conclusion of the storyline. Then, three scenes later, it dawned on us that we'd only just made it past the prologue. It took another 100 hours for us to actually finish the story. DA:I's experience customization is also worth mentioning. As a party-based game, you'll be traipsing around as yourself with three other characters most of the time. Your party composition, however, is more or less up to you. If you just want to watch the world burn, try a party of all mages. With the right skill setup, you can pretty much crowd-control any situation until everything explodes from the unending barrage of spells. If you're more of a traditionalist, you've also got the option of a "balanced party," whatever that means. An exciting combat system, untold pages of scripted dialogue, and a surprisingly deep story which touches on elements from loyalty to faith to skullduggery fit together perfectly to create an unparalleled RPG experience that should not be missed. Next up, Best Strategy Game of 2014. Click here!